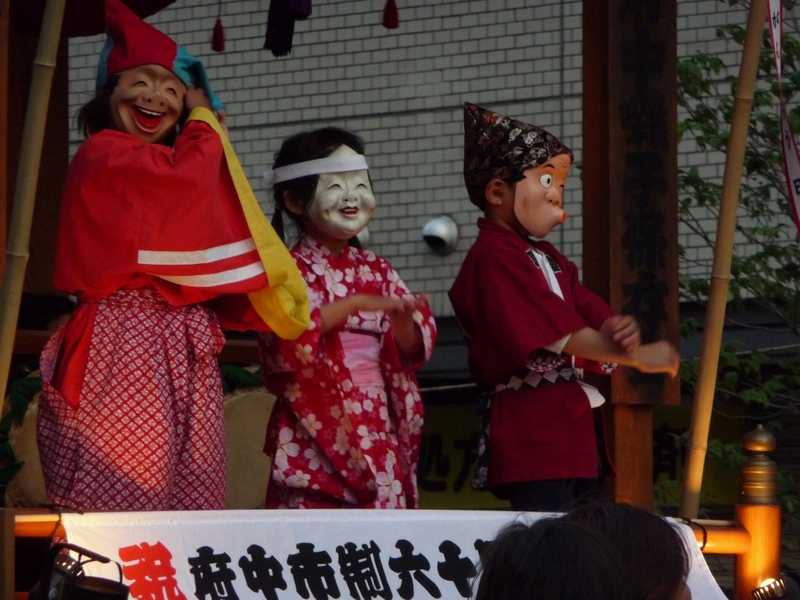 After such an enjoyable mantou dance competition, I really had to wonder if the Kurayami Matsuri (Darkness Festival) had anything else that could possibly compare. 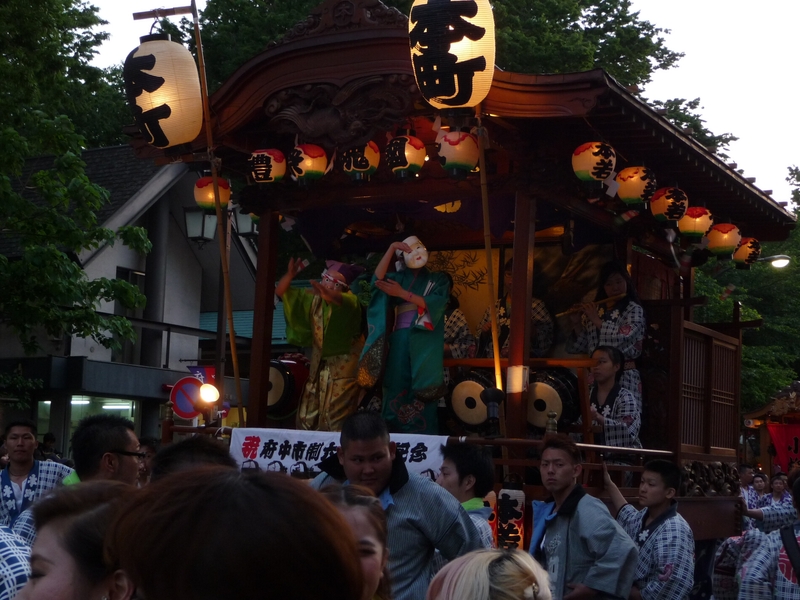 We quickly found there was still plenty to see including taiko drums making their way through neighborhoods, floats with masked characters and musicians, and mikoshi parading through the streets. One of my favorite parts of the festival was the sound of the taiko (太鼓, traditional Japanese drums) as they made their way through the neighborhoods to the festival area around Okunitama Shrine. 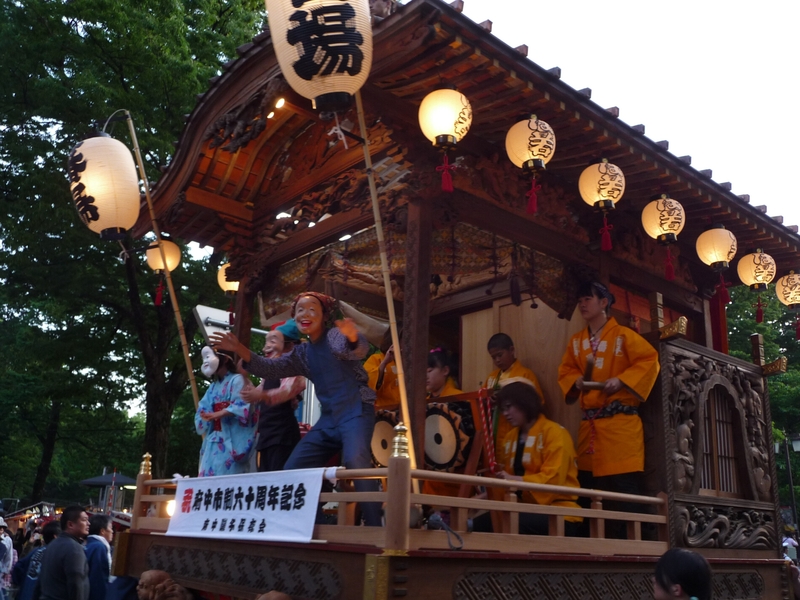 We had wandered away from the shrine between scheduled events to take a look around Fuchu City but just a few blocks away I began to hear the characteristic taiko drum beat. So what did we do? We followed the sound to the drums of course! The low, slow and powerful beat we followed reminded me of the rumble of thunder in the distance. We found a group making their way slowly through the neighborhood with a huge taiko drum. 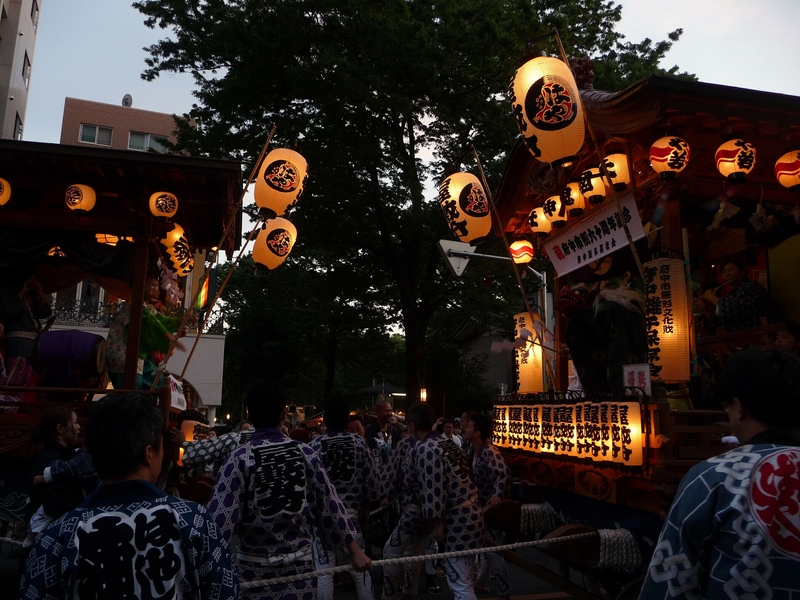 According to one of the group members who stopped to talk with us, the purpose of the taiko’s journey was to purify the neighborhood and drive out any evil spirits. 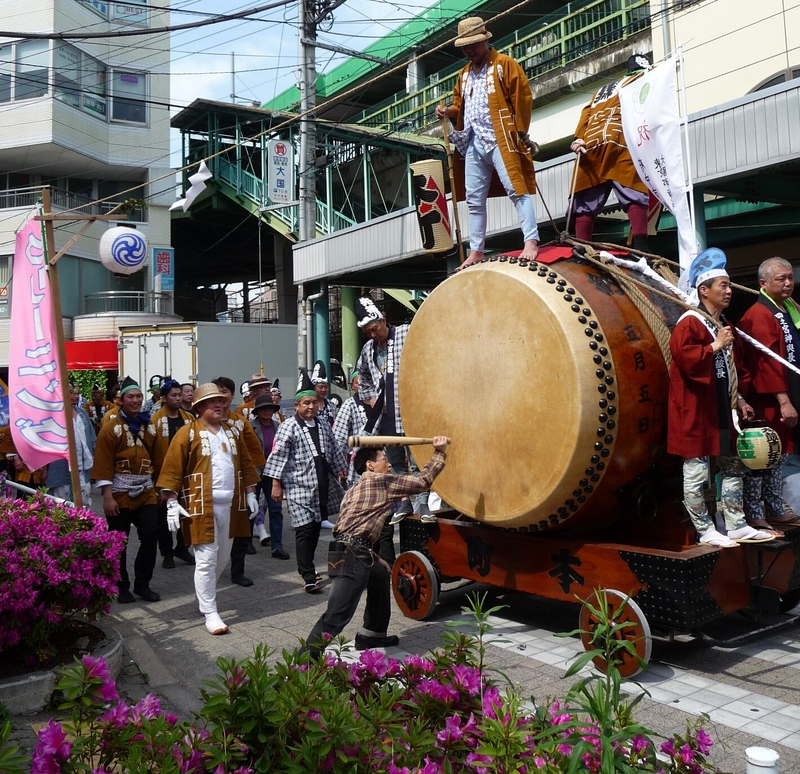 Several of these groups with taiko made their way through the surrounding neighborhoods before returning to the festival at the Okunitama Shrine grounds. Anyone riding on top had to be careful to watch for low-hanging wires and shrine gates. Toward the end of the day, it was time for a parade of floats carrying all kinds of comical characters and musicians. The floats are atop wheeled carts and pulled by a very long line of participants. 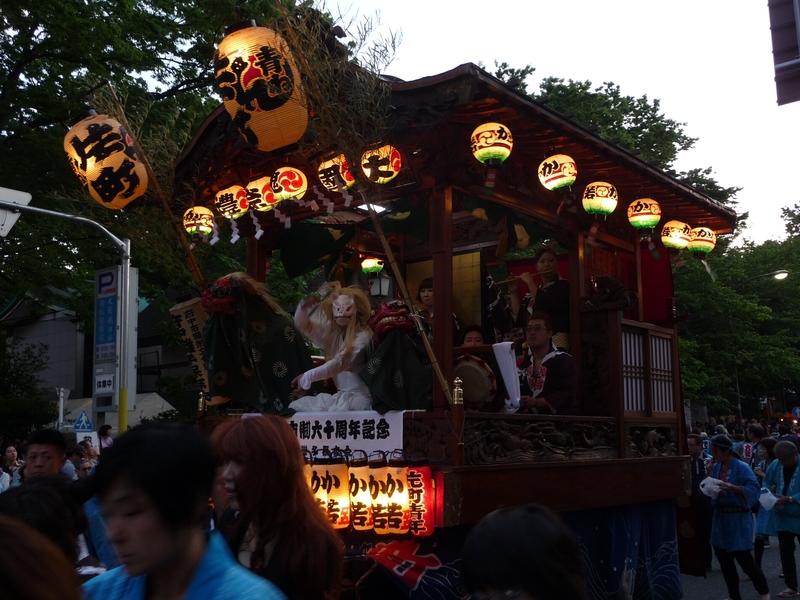 Each float came through the shrine gates and made its way down the street before turning and going back the way it came. 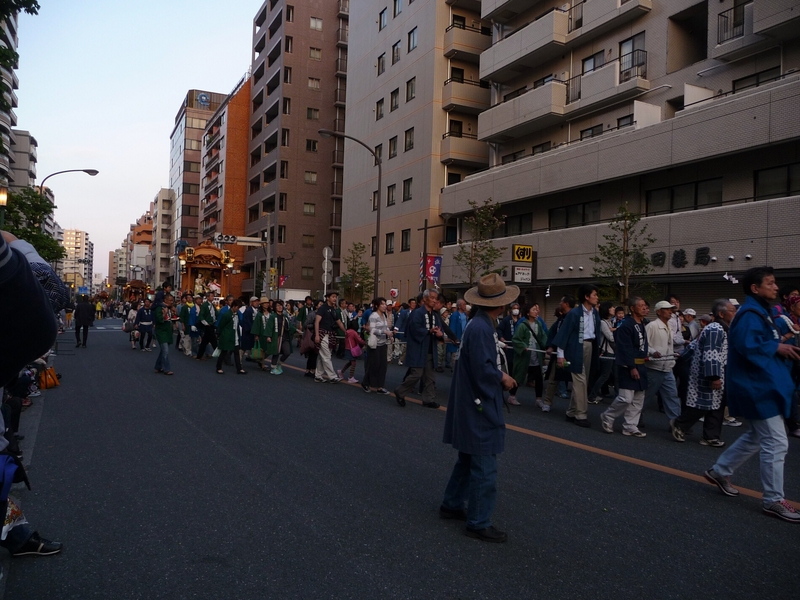 With such long lines of people pulling, I was impressed they were able to turn and even pass by each other. 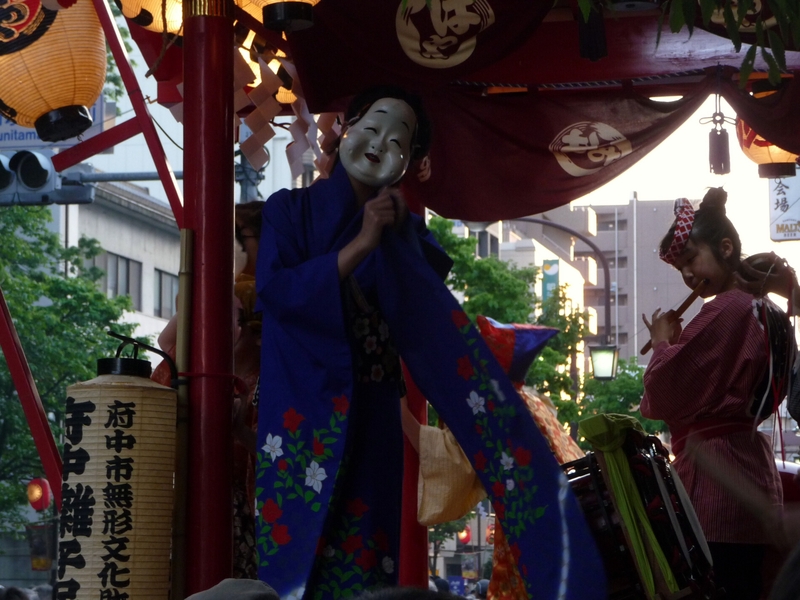 The characters on the float all wore simple masks that had distinctive expressions. Each float also had some musicians on board to set the mood for their characters. Here you see this float had several percussion instruments. This character used small hand movements and tilts of the head to make it seem like she was dancing to the lively flute music her companion was playing even though she had very little room to move on the float. Here you can get a close look at some of the characters on another float. I was surprised to see most of the characters were played by children. They certainly seemed to have tons of energy and kept dancing around giving life to their masks. Here you see another example of how small tilts of the head and hand movements can create a mood and give you a sense of the character’s emotions. The character on the left seemed very comical while the one on the right seemed much more elegant and graceful. Some of the floats had fierce characters striking poses. I think the two with red masks are dragons while the one with a white mask is a fox spirit. When two floats went past each other, they would stop for a moment and have a short battle of poses and music! One float was even designed so the front could be tilted up above the participants heads! Here you can see the float on the left is tilted upward during its battle with another float. Maybe this is a way of “getting the upper hand” in battle? With all the music, masked characters and float battles, this was a great parade! 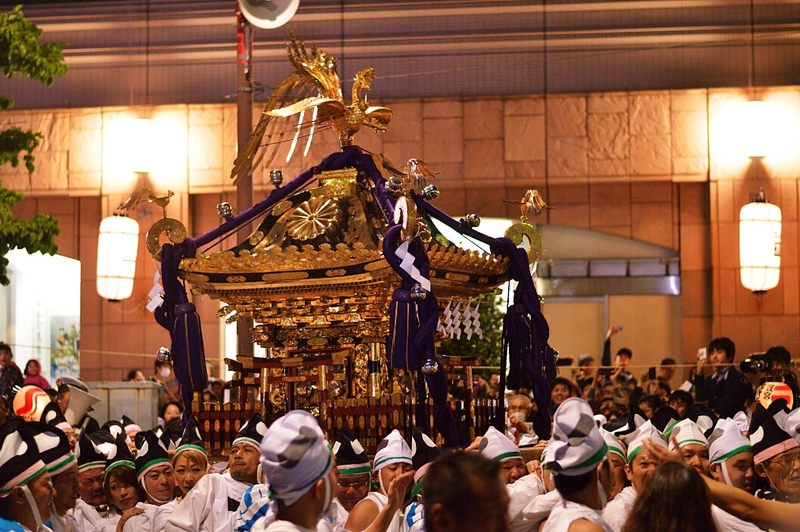 Mikoshi (御輿, portable Shinto shrines) are basically palanquins that can be used as vehicles for transporting deities between shrines. 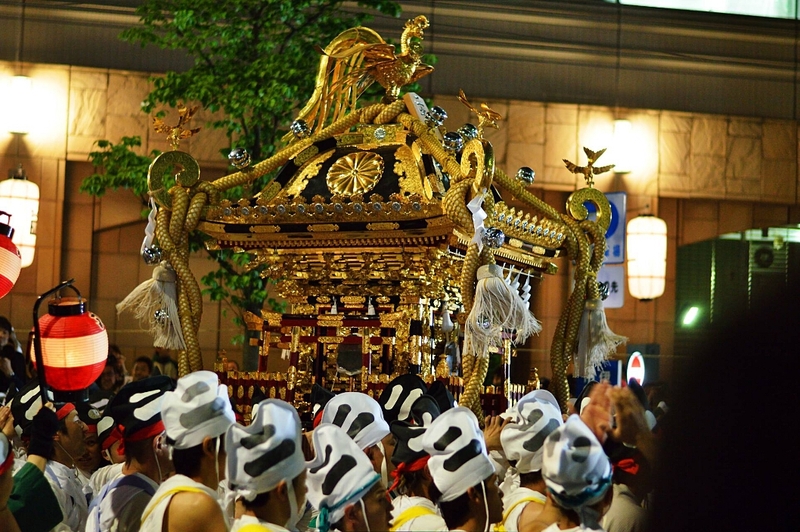 During a festival like this one, the mikoshi serves as the vehicle by which the shrine deity can travel through the city and basically becomes a small shrine itself. They tend to be very elaborate and somewhat resemble miniature buildings with walls, railings and a roof. 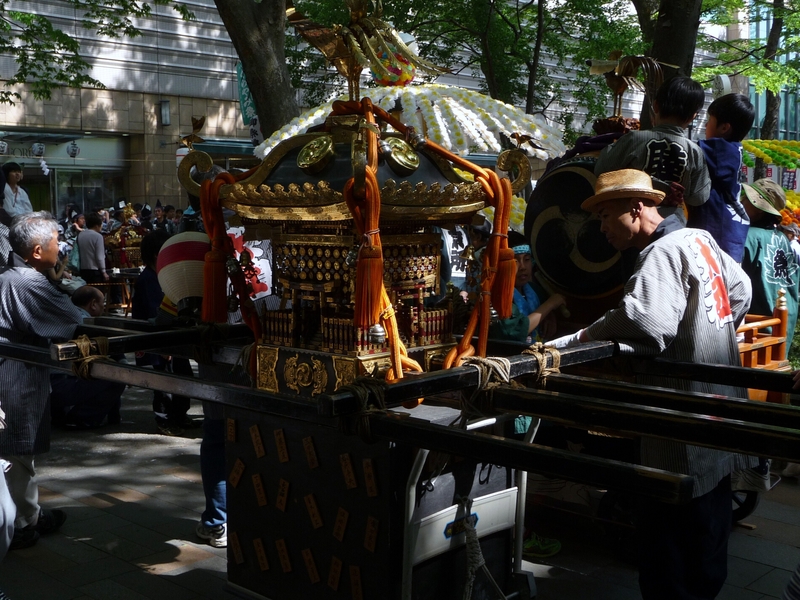 I saw this small mikoshi earlier in the day before the main parade. It’s not nearly as elaborate or large as the ones in the parade but this gives you a good idea of how they are constructed. 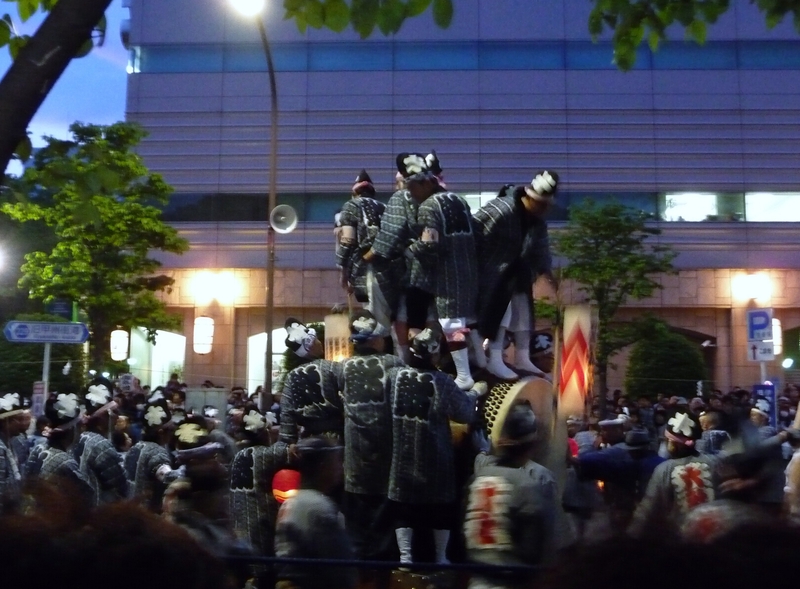 Participants carry the mikoshi on their shoulders by means of the poles you see here. Before parade time, we were able to sneak a peak at the large mikoshi resting on blocks called uma (うま, horse) in the main shrine grounds. 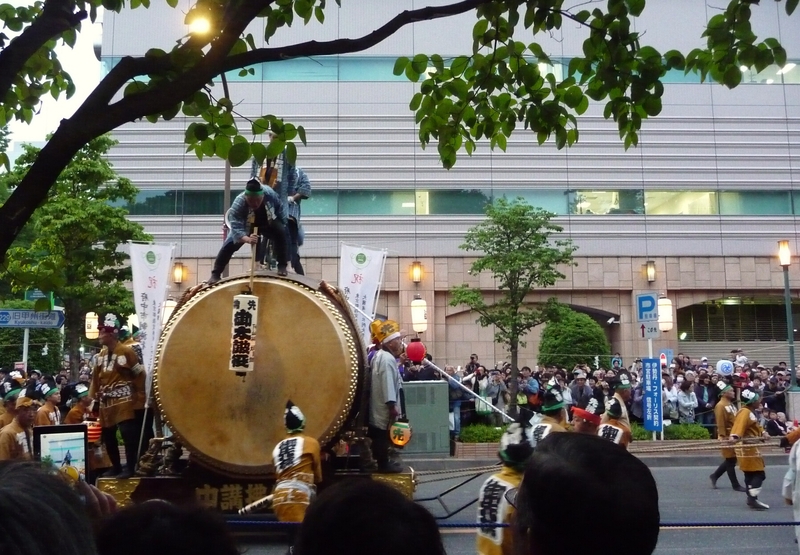 Of course the main mikoshi parade event had to be started off with huge taiko leading the way. This taiko had so many people on top that I was worried someone would fall off. Luckily, they all had straps to hold onto and though I did see some slipping every now and then, they always seemed to steady themselves with the strap and hang on for the ride! 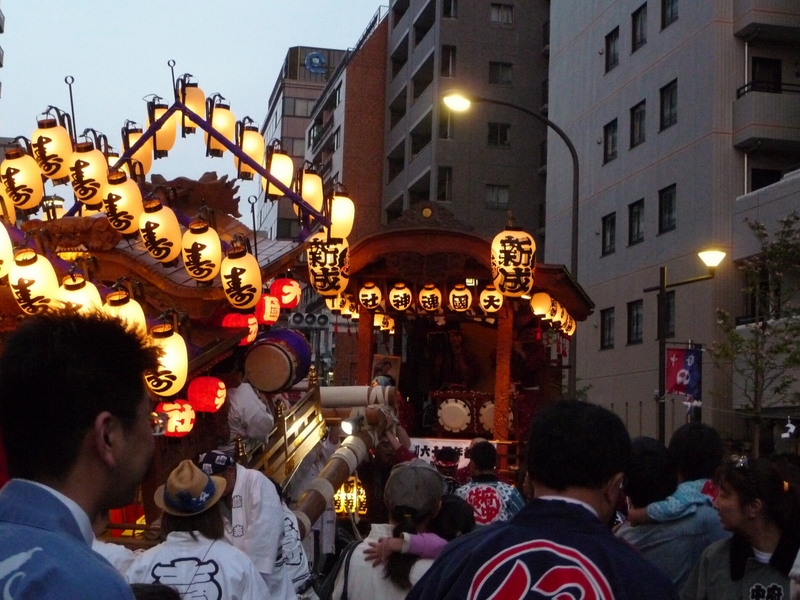 Here you can see one of the large mikoshi in the main parade event. It’s very elaborate with a phoenix on top and even has small torii (gates) as part of the miniature shrine. Since these are so large and weigh hundreds of pounds, it takes a lot of people to carry them. 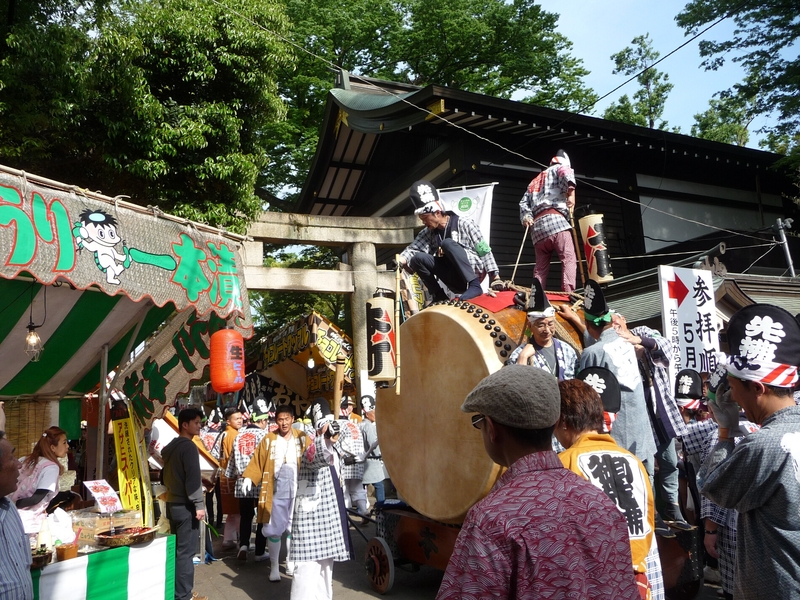 As the mikoshi made their way through the streets, the participants bearing them chanted loudly as they jostled them up and down and side to side. (You can see the tassels are swaying in this photo.) I’ve heard this is to amuse the deity inside but whatever the reason, it makes for a good show! With so many people carrying them and no one person really in charge of direction, they sometimes careened wildly in one direction or another but somehow always managed to stop before crashing into the crowd. Once the parade was over, the mikoshi continued their voyage into the neighborhoods that worship at the shrine in order to bless them. 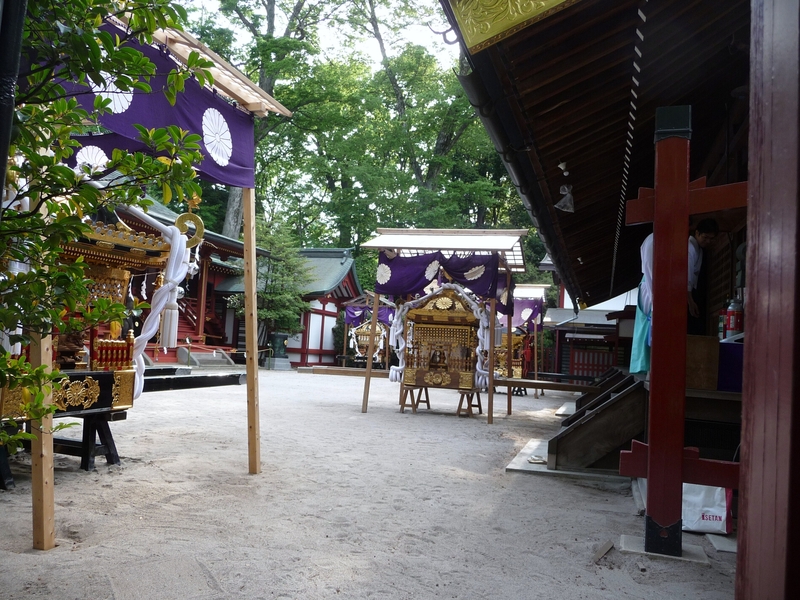 They had so much ground to cover that they were not supposed to return to the shrine until early the next morning. We headed back to catch one of the last trains and call it a night but this is one festival I will not be forgetting anytime soon!